At the beginning of the year I made a pact not to buy any new books this year. January went by and I fulfilled my personal vow. One month down, eleven to go. In February I smoked us out of house and home and away from all of our books. (It looks as if they are going to toss all of my books and I'll be replacing them all. Whimper and sigh.) I renege my vow. I will not just buy SOME books this year, I will be RE-buying A LOT! Also, I can't exactly sit with our family in temporary housing without a book in sight now, can I?! That is just not to be borne! We have a lot of spare time these days and I'd rather like to use it well and part of using our time well means to read. So I went off to Goodwill in search of a chapter book and some picture books to tide us over. 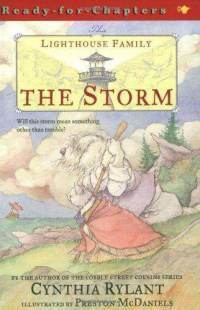 In this introductory chapter book, we meet Pandora the cat and keeper of the lighthouse. She's been keeping the lighthouse for four, long years and is frequently quite lonely. However, she keeps at the job because her life was once saved by a lighthouse and she is interested in saving the lives of others. One stormy night it so happens that her light saves the life of a dog named Seabold. Seabold is a sailor dog and prefers to always be alone at sea. However, he lost his boat and the use of his leg during the storm and discovers himself a resident of the lighthouse for one long winter. During the winter, Pandora and Seabold discover friendship and their own blend of family. (I'm going to ignore any potential political statements that could be twisted from this. They are so very faint and not easy to discern from the story that I'm pretty sure it's just my adult modern brain that is picking up the vibe because we're inundated with arguments about What Makes a Family these days. I feel pretty confident that Rylant is just telling a cute story.) Mostly what I discern is that this is a story about loneliness and friendship and most of the reviews online that I found seem to think the same. "Rylant's strength is her creation of appealing characters that appreciate the security of home even as they yearn for adventures within safely defined boundaries." That, I like! I like it very much! "Thus, as the wind grew crisper and harder and the sky filled with birds going away, Seabold stood at the edge of the shore and realized that this winter he would not sail. He thought that he would be despondent. He thought that he would be depressed. I really enjoyed this story and Bookworm1 did also. He liked the fact that the book was short. (Ha!) He liked the animal characters. He liked that they lived by the ocean and that Pandora mentioned that she had a whale friend who passes by seasonally. He was hoping that we'd meet the whale in this book but judging by the rest of the titles in this series, I think he's in for some fun surprises and treats. I'm not ready to say, "Move over, Tumtum and Nutmeg!" Not at all. But I think we can make some room on our shelves by adding this series to our collection. And there really is no better time than the present to read this series so -- guess what?! :) We're going to do it! I think we'll be pleasantly occupied with The Lighthouse Family for a bit. Because yes, I did so just throw those books into my Amazon cart! Yikes -- I would hate to lose all my books even though thrilled to get new ones. I sobbed through the end of this read-aloud b/c I thought it was so precious. It felt like a story of our family (We have 3 children that were adopted)! It was sweet and charming. We read the whole series but none touched me like the first. My girls loved them all though! Sorry about your book collection! That must be hard. I love Cynthia Rylant - I have never heard of this series. It's going on my list! Yep, we loved these, too. I dont' think we ever finished the series, though. And yes, I, too, picked up on potential politicizing (?) of the story, but I just mainly ignored the possibility and enjoyed the story. I just added this to our library request queue. Thanks for the review! Going to check this out - I love Cynthia Rylant! I'll have to check these out! We are HUGE fans of Annie and Snowball and Henry and Mudge here, and I've bought N1 the Cobble Street Cousins series (or most of it).